Watch Unathi out dance the fastest man on the planet. 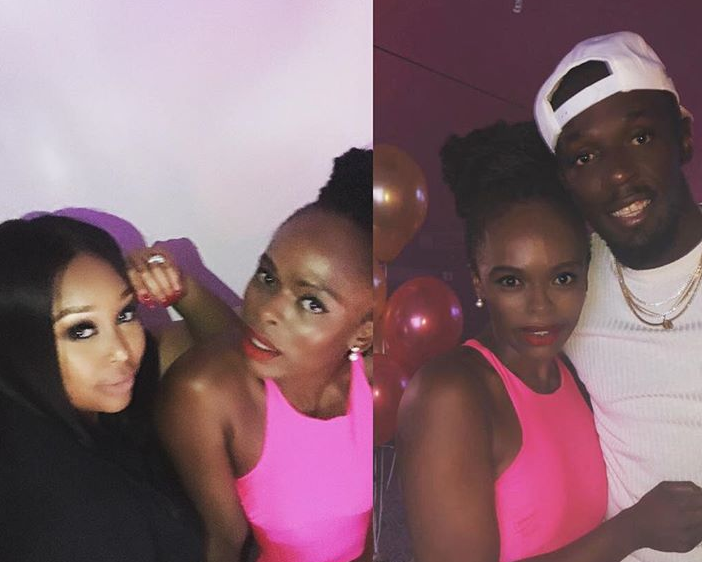 Usain Bolt had no idea what he was getting himself into when he challenged Unathi to a dance-off. The Olympic gold medalist was in South Africa a few days ago to host the Sun Met with Minnie Dlamini in Cape Town. Before hosting the popular horse racing event, the GH Mumm ambassadors enjoyed a night out on the town in Johannesburg, where he launched his 'Usain Bolt Olympe Rose' champagne. Minnie's close friend, 'Idols SA' judge Unathi, tagged along and had an epic time on the dancefloor. "The FASTEST man on earth challenges me to a get down dance-off. At first I tried HUMBLY to decline saying ‘Bruv as much as I could never challenge you to a 100m sprint I don’t think you want to challenge an African child to a dance challenge. Our squat game is for the gods of WAKANDA.’ He insisted. As you can see I WON,' Unathi wrote on Instagram. Watch their dance-off below. Swipe left to see more. Usain then showed off his dabbing skills at the Sun Met with Minnie.